How To Setup Kayfun Prime – A Guide on How To Set Up One of the Best (and Most Expensive) MTL Vape Tanks Around! You might not have heard of Kayfun. They’re a European vape tank designer, and they make some of the best MTL vape tanks in existence. And this isn’t just my opinion; no, many seasoned vapers swear by Kayfun. For this reason: many view Kayfun tanks as the last word when it comes to MTL vaping. I recently got myself the Kayfun Prime. My first ever Kayfun purchase. And I have been more than impressed by it – big time! This is a guide on how to setup the Kayfun Prime properly. I’ll include loads of pictures and detail every step you need to take in order to get the best possible vape from your Kayfun Prime. The Kayfun Prime is an MTL vape tank. It is not designed for high-power vaping. You run this vape tank under 15W usually. But you still get great vapor production and truly amazing flavor. The deck, however, is very small. And this means you will have to create your own coils. This is super-easy, however – all you need is some wire and a coil-rolling kit like this one from Coil Master. Clapton’s and bigger types of coil simply WILL NOT fit on the Kayfun Prime’s deck. I’ve tried, believe me, and there’s simply not enough room. My preferred build for the Kayfun Prime is 7-wrap 26g Kanthal coil. 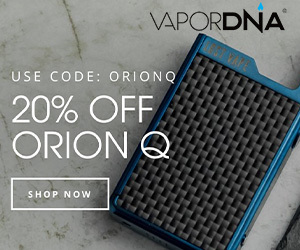 I usually get anything from 0.9ohms to 1.2ohms. There are two screws, one for each terminal. Once you have your coil made, simply unscrew them to create a gap beneath in which you insert your lead. When the leads are secure, tighten the screws and snip the excess wire. For the BEST possible flavor, you want to ensure the coil is placed squarely over the airflow hole. Leave a gap of 1-2mm, so it sits just above it. This is the optimal positioning. I did my first wrong (it wasn’t quite centred) and the flavor was impaired pretty dramatically. In this respect, precision is key. 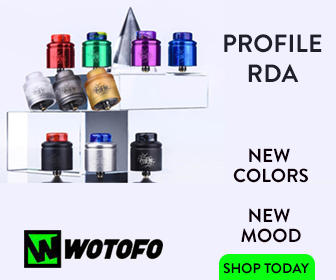 If you’re used to RDA and RTA tanks, wicking the Kayfun Prime might feel a little weird. Less is more in this context. The coil is A LOT smaller, so you don’t need too much cotton to wick it properly. You’ll want to make sure the cotton is fluffed up correctly and the right thickness. There should be a slight resistance when you pull it through the coil but not enough to make the coil move. Next, you need to trim the cotton down. I tend to align my cut with the outer rim of the tank. Once I’ve done this, I’ll thin out the ends with my scissors. The Kayfun Prime doesn’t need MASSES of cotton. Again, less is more in this regard. There are two slots either side of the coil. This is where the ends of the cotton need to go. Tuck It In And, BOOM, You’re Done! Carefully push the cotton into these slots, and ensure they are covered but not too stuffed. You want it to wick, but you don’t want big clumps of cotton. Make sure your cotton is nice and fluffy before you put it in there. Do this and you shouldn’t have any problems. Remember: less is more with Kayfun tanks. Simply screw everything back together, open the juice flow slightly, and start vaping. 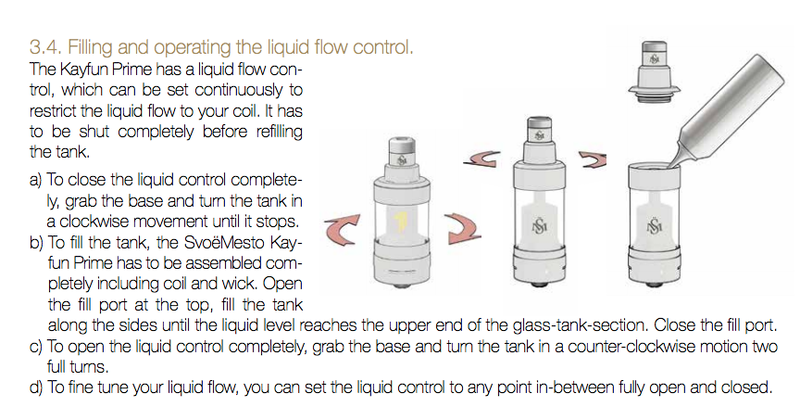 The juice flow control system on the Kayfun Prime was the only aspect of the tank that confused me. I didn’t really get how it worked. And this affected my first couple of vapes with the tank. Basically, to lock the juice flow control, you turn the tank all the way to the left. This ensures no juice gets to the coil. Once your tank is full of vape juice, turn the Kayfun Prime tank right a few twists. You will see bubbles. This means the juice is flowing to your coil. You’re now ready to vape. Interested in picking up a Kayfun tank? VaporFi has a range of Kayfuns.